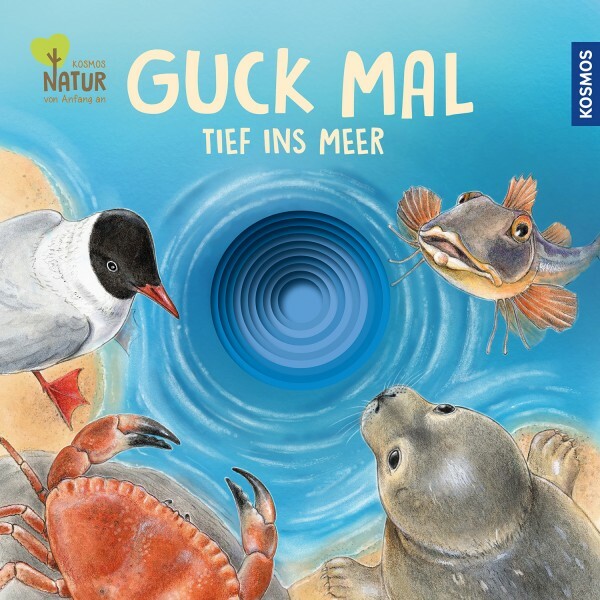 Product information "Guck mal tief ins Meer"
In the Ocean: Sand hopper, lug worm, slipper limpet, common jellyfish, gurnard, mackerel, harbour porpoise, seal, starfish, edible crab. What’s that, holes in the book? Yes, and special ones at that! Toddlers love to look through something somewhere and use their fingers to feel what’s behind it. This is why the punched holes guide the gaze and small fingers into mysterious worlds. Who or what lives in the ocean? Which animals hide below the soil? Each time a page is turned, insight into the animals’ living environment becomes more intensive. Magical, lifelike drawings show animals in their mysterious habitats. And at the end of the journey deep into the earth and deep into the ocean, a small treasure waits to be found. Lisa Apfelbacher is a science illustrator and graduate forest scientist. As a freelance illustrator, she combines her technical knowledge with her love of drawing.